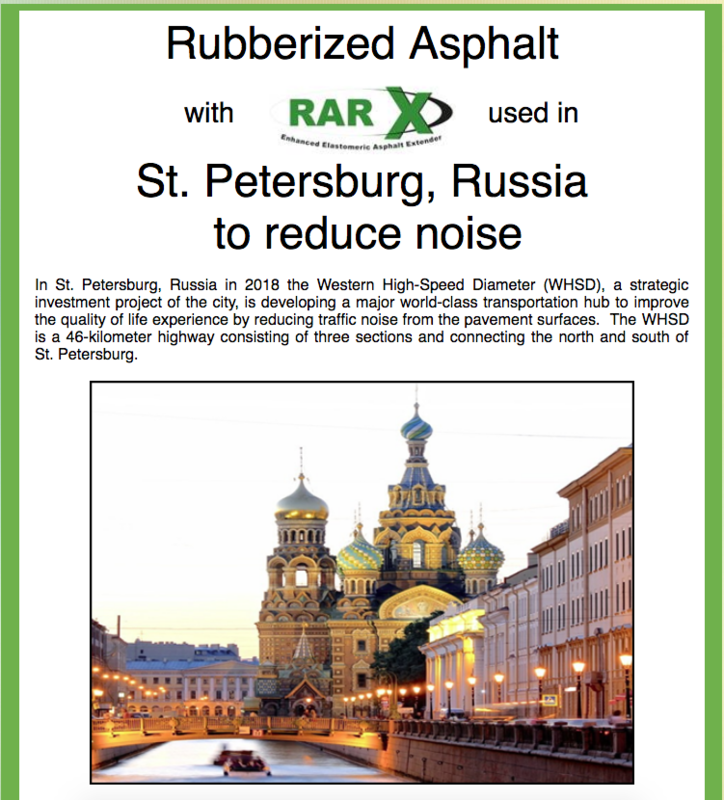 In St. Petersburg, Russia in 2018 the Western High-Speed Diameter (WHSD), a strategic investment project of the city, is developing a major world-class transportation hub to improve the quality of life experience by reducing traffic noise from the pavement surfaces. The WHSD is a 46-kilometer highway consisting of three sections and connecting the north and south of St. Petersburg. The challenge was to find a mix with low air void content (2 percent or less) yet capable of providing cost effective noise reduction, good rut and wear resistance and wet friction property. Maidanova Natalia, PhD, Deputy Director for Quality, Head of the Research Center ABZ1 proposed the use of an asphalt hot mix with rubberized asphalt with RARx which combines the benefits of the dry and wet process of asphalt rubber, thus allowing greater amounts of ground tire to be incorporated in the hot mix. RARx is reacted and activated rubber which can be placed directly as a dry powder into the pugmill of the contractor’s plant. CONSULPAV (www.consulpav.com) under the support of SILENT RUBBER PAVE project (silentrubberpave.eu) provided technical input to this project. The 25 tons of RARX required for this job was supplied by CIRTEC.